Being aware of safety issues when using your pole is very important in avoiding injury to yourself (or your students), as well as possible damage to your property. That's why Your Pole Pal has devoted several pages on this site to covering this important topic. Please keep in mind that the following dance pole safety tips are general in nature, and there are no guarantees that you will never suffer injury or damage if you follow them. Only you can ensure your complete safety by correctly installing your pole, using caution and common sense, and knowing the limits of your equipment and your own body. #1 - Wash your hands before you dance to remove lotions, creams or any natural oils on your hands, as these can cause you to slip or lose your grip entirely. This sport definitely does not mix well with hand lotion, baby oil, or other similar substances! BONUS - If you're sharing equipment in a class setting, frequent hand washing will also help prevent the spread of colds and flu. #2 - Remove rings, watches and any other loose jewelry to protect your pole, your jewelry and yourself from injury. Rings and watches can cause damage to your expensive equipment, including scratches and scrapes to the finish. And depending on what they're made of, rings especially can suffer damage, not to mention contributing to blisters and pinched skin at the base of your fingers. Loose jewelry such as necklaces can also become a hazard when learning spins and inversions. At best, these can distract you as they fly about, and at worst they could become caught between you and the pole, causing you to lose your grip and fall. For these reasons, it's best to get in the habit of removing jewelry every time you practice or work out. 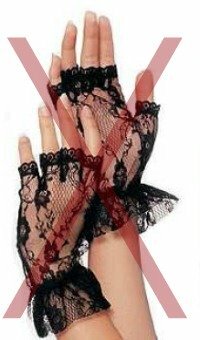 #3 - Avoid covering your palm with gloves or other fabrics. While gloves marketed specifically for pole dancing may provide the grip you need for climbing safely, they will hinder your spins and other moves. You can read more about these gloves, and why Your Pole Pal recommends only the gauntlet type that leave your palm uncovered. Other fabrics can be downright slick, and are best avoided if you intend to do any weight bearing or airborne moves. Remember, injuries are inevitable if you don't have a good grip. If you get very sweaty palms, you may wish to try out one of the popular grip products that are available worldwide. #4 - Use a spotter or helper when learning new moves. This is especially important when doing advanced moves such as inversions and releases. The risk of falling is greater, and the consequences of a fall are more serious with these types of moves, so protect yourself and practice good safety measures by having someone spot you. A spotter's job is to focus on you and your safety, so make sure there's someone who can give 100% of their attention to you when you practice new moves. The spotter can also help you get your bearings and assist you in correct body placement, which can be a challenge when you're upside down! 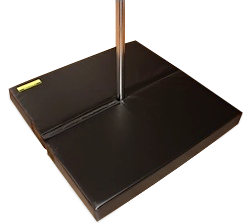 #5 - A safety mat is a good option when learning inversions and other advanced moves. While it shouldn't take the place of a spotter, it can definitely give you increased confidence. And just in case it's ever needed, a crash pad will help soften your landing. #6 - Be sure to do regular safety checks of your equipment, including the fittings and small parts such as cotter pins, screws, etc. The saying that "the devil is in the details" definitely applies here. Take a few moments to do a quick safety check of your dancer pole each time you use it, and you could avoid a painful accident or damage to your property. Here's a short video that shows how to load test a friction fit or removable pole before use. If you're not sure how to test that your equipment is safely installed, you might find it helpful. And finally, never take your pole for granted. Play safely and keep a healthy level of respect for your equipment. This way, you are much less likely to experience an injury, and more likely to enjoy this fabulously fun fitness activity! Visitors share their very own pole dancing pictures with us. Come take a look and get inspired! These illustrated guides are an affordable learning too, whether you use them on their own or as a supplement to classes, DVDs or online lessons. Great value, and super helpful!